Electrocrania immensipalpa Kusnezov, 1941: 19 - 22. Image A from Kusnezov, 1941. Holotype. Image B1 + B2 from Kusnezov, 1941. Fore wing venation. Image C from Kozlov, 1988. Fore wing venation. 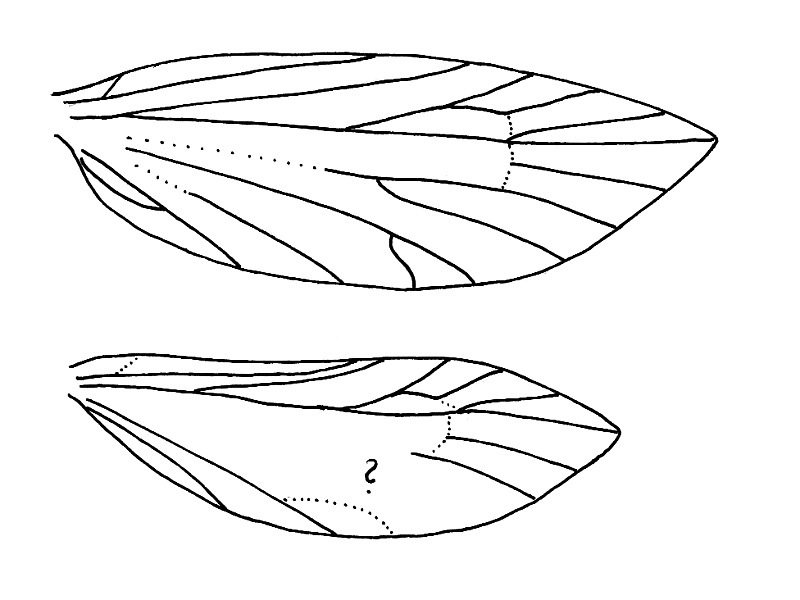 Description of adults: Examined: Drawings of holotype by Kusnezov (1941) and Kozlov (1988): Forewing length: 3.2 mm; maxillary palpi very long, about 1 mm in total length; labial palpi not visible; antennae relatively thick, about 3/5 of forewing length, with long ascoid sensillae, therefore appearing to be ciliated; venation incompletely visible: R1 free, meeting the costal margin at 1/2; R5 meeting the costal margin slightly anterior to the apical tip, M1 distinctly posterior, M3 meeting the outer margin at about 2/3 of the forewing length; presence of an epiphysis on the foretibia not clearly visible; stated single mesotibial spur (Kusnezov 1941) probably but a bristle (?, not clearly visible; following Kristensen in litt., the proposed tibia might also be an elongated tarsomere, but this is rejected by Kurz 2015); spur formula therefore probably 0-0-4. 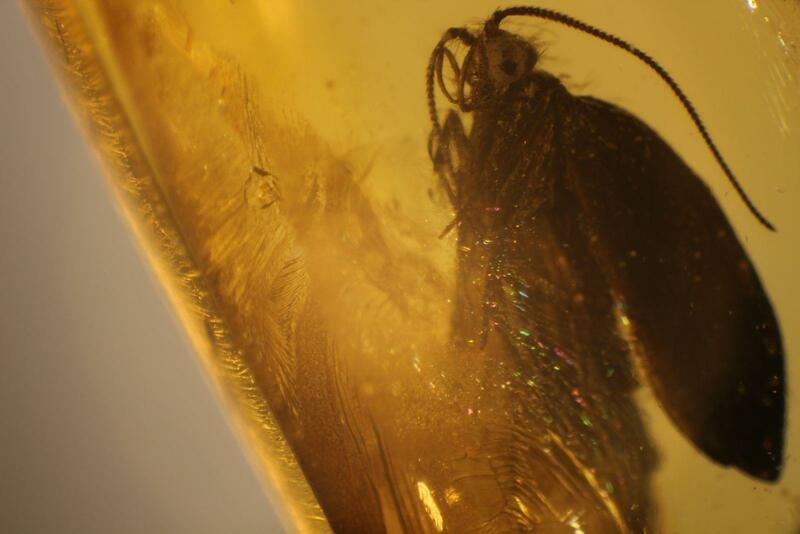 The single specimen has been found in the Baltic region in amber, which has to be attributed to the Lutetian period of the Eocene. 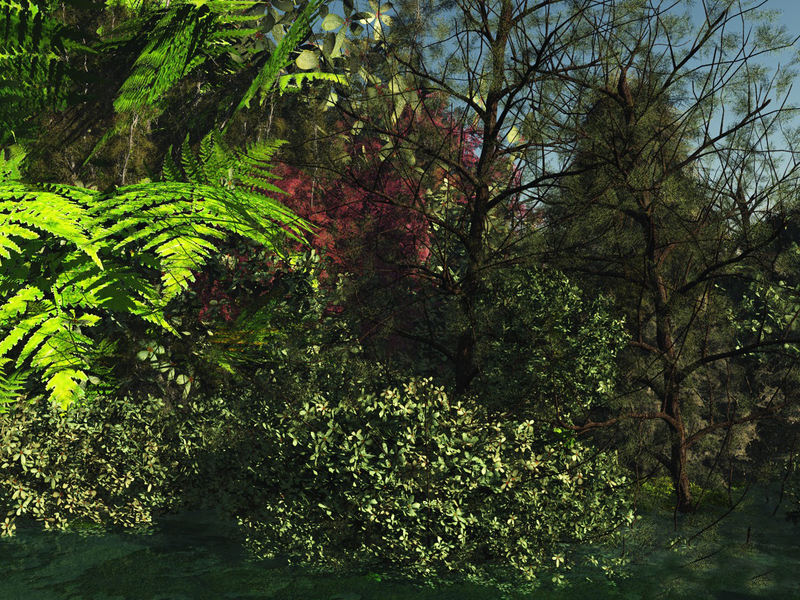 Computer model of a baltic amber forest. The amber woods are assumed to be partly moist, coniferous woods. Similar plant associations have been found from southern North America across Northern Europe to eastern Asia (anonymous 2010). In a relatively warm period in the Eocene, the amber wood streched from Scandinavia to the Ural Mountains in a broad belt. In the south, it was bordered by an ocean, which reached far into eastern Europe and Asia. The wood consisted of coniferous trees, mainly Pinus succinifera and ancestors of the recent genus Pseudolarix, but also contained decidous trees like oaks (Quercus sp.). Electrocrania michalskii Kurz, 2015 is distinguished from Electrocrania immensipalpa Kusnezov, 1941 primarily by the apical position of R5 in the forewing, which is distinctly preapical in E. immensipalpa, but exactly apical in E. michalskii. Phylogeny: From all other Micropterigidae, except for an undescribed species from New-Caledonia (Kristensen 1998), Electrocrania is distinguished by the unforked vein Sc of the forewing. Distinct glands at sternum V of the abdomen are not discernible, therefore the genus cannot be assigned to the southern lineage of the so-called Sabatinca-group. The very thick antennae and the long branches of the ascoid sensillae are very reminiscent of genera like Epimartyria (North America) or Paramartyria (Japan). The structure of the male genitalia, although badly discernible, seems to fit best to these genera too, on no account however to Micropterix. Despite the preapical to apical position of R5 in the forewing, an assignment to the Micropterix-lineage is therefore not acceptable. Baltic amber is attributed to the Lutetian period of the Eocene. Its age is therefore assumed to be between 40.4 and 48.6 Ma (following Ritzkowski 1997, the age of Baltic amber is about 44.1 Ma). Following Kusnezov (1941), the amber sample containing the specimen crumbled after having been soaked for five days in toluene. anonymous 2010. The Palaeobiolgy Database: URL: http://paleodb.org/cgi-bin/bridge.pl?user=Guest&action=displayHomePage [online 29 January 2010]. Davis, D. R. 1978. A Revision of the North American Moths of the Superfamily Ericranioidea with the Proposal of a New Family, Acanthopteroctetidae (Lepidoptera). Smithonian contributions to zoology 251, 131 pp., 344 fig., 3 tables, 6 maps. Kozlov, M.V. 1988. Paleontology of lepidopterans and problems in the phylogeny of the order Papilionida. - In: Ponomarenko, A.G. (ed. ), The Cretaceous Biocoenotic Crisis in the Evolution of Insects: Moscow, Nauka Press, p. 16-69 (in Russian). Kurz, M. A. 2015. On the systematic position of Electrocrania Kusnezov, 1941 with the description of a new species from Baltic amber (Lepidoptera: Micropterigidae). Zootaxa 4044 (3): 446-450. LepTree Team 2010. 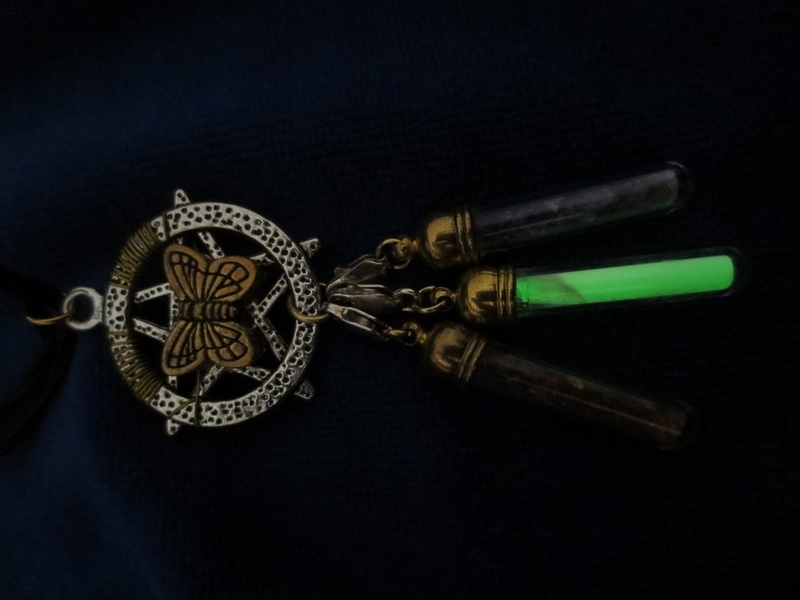 URL: http://www.leptree.net/micropteryx_immensipalpa [online 27 January 2010].